Since 2010 I have been pregnant four times. If you factor in nursing, there was only a brief period of time in 2013 when I wasn't growing or sustaining a life with my own body. It left me feeling very ... not myself. I felt like I hadn't "owned" my own body in quite some time. So, after baby Charlie was born in September, I embarked on a get healthy journey - a journey to not only lose weight, but retrain my brain and body on things like portion control and not giving into every craving - things that I had really let go of during the last five-ish years but had always previously been a part of me. 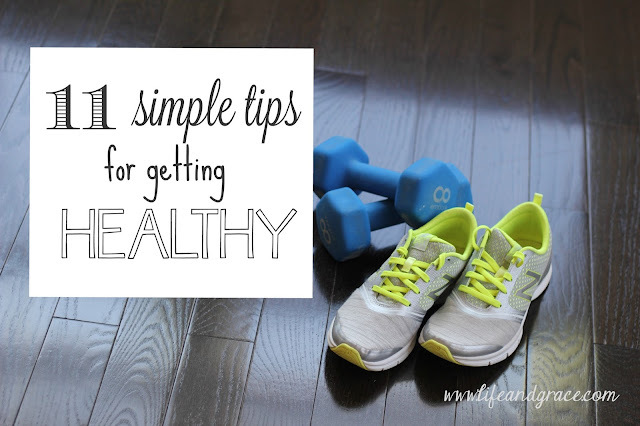 So friends, here are 11 tips on how I've been losing weight and getting healthier. These tips are easy and attainable for just about everyone. 1. Portion size - I keep a pretty easy gauge here - don't eat as much as your husband. Unless you're married to Jack Sprat. In that case, just eat a modest portion size that you know will fill you up an appropriate amount - no overstuffing, no leaving you wanting a snack in 15 minutes, just a modest, good amount. 2. No seconds - don't do it. If it wasn't on your plate to start with, don't add more. Veggies can be an exception. 3. Don't eat anything after dinner - This one's kind of tough because I get the evening munchies. But after dinner I'll let myself have something sweet and then ... no more. You can do it. Don't be afraid of an empty stomach - you won't die, I promise. 4. Eat protein at breakfast - This one's crucial for me. It helps keep my blood sugar at an appropriate level and avoid crashes that make me run for a sugary snack. 5. Small amount of calories at breakfast - A boiled egg and a piece of fruit are my standard. Very low calorie but filling and, like I mentioned above, blood sugar stabilizing. 6. Some of everything, not a lot of anything - These wise words come from the beautiful Giada de Laurentiis herself. I love this because it gives me limitless options as long as I'm responsible with portion size (see #1). And it keeps me from depriving myself and then wanting to binge on anything chocolate and cream-filled. 8. Exercise Regularly - I typically exercise about 5 days a week, 30-40 minutes. I did Couch to 5K after Charlie was born and loved it. It makes running super attainable for your average couch potato. It's awesome. Lately I've been doing P90X3, a sort of at home cross training workout. I love it and have noticed a huge difference in my overall fitness and appearance. Plus the workouts are fun. Highly recommended. 11. Think "Am I making the best choice I can right now?" - This one came from reading Made to Crave, by Lysa Terkeurst. Leftover pizza in the fridge calling your name? Yum. But maybe instead of three slices, have one nice slice, a side salad, and skip the soda. See? I didn't say you have to have a goji berry, wheatgrass, chia seed, barf smoothie every time you're hungry. Just ask yourself if you're making the best choice you possibly can with the current options available in your fridge and pantry. This mentality is huge for me. So, there you have it. These 11 things have been a huge part of my life since September, and I'm happy to say I'm only one pound (one!!) away from pre-baby weight. But, more importantly, I feel good. Making these choices has been making me feel much better about myself and I feel like I am not as controlled by my belly as I was a few months ago. If you want to make some changes, I encourage you to. If you're feeling alone about it just remember, I'm out here doing it too. Do you have anything to add? What healthy choices make a big difference in how you feel? How'd you kick the baby weight? Good job, Sarah. While I was at your house tonight I actually thought about how pretty and trim you were looking. Uh, I actually like Goji berry wheat grass barf smoothies.